KIEV, Ukraine -- President Vladimir Putin’s intransigence over Ukraine risks turning him into a global pariah should the blame for downing a Malaysian Air jet fall on pro-Russia rebels. Until now, Putin has been able to stand firm against economic sanctions and Western finger-wagging. The tragedy, should investigators find it was caused by Russian-armed and poorly trained Russian rebels, raises the stakes. The crash of the Boeing Co. (BA) 777, which had 298 people on board, followed by less than 24 hours the imposition of new sanctions against Russia that targeted major energy companies and banks. While the rebels denied accusations by the Ukrainian government that they shot down the flight, U.S. military and intelligence officials said the evidence so far indicates a Russian-made missile hit the plane. “If there is solid evidence that it is the militants who did it and the weapon originated in Russia, there will be really strong pressure on Putin to really contribute to de-escalation,” Masha Lipman, an analyst at the Carnegie Moscow Center, said by phone. Putin, whose popularity has soared to near-record levels since March, when he annexed Ukraine’s Black Sea peninsula of Crimea, denies accusations of supplying arms and volunteers and says he’s trying to broker a peace settlement. The Russian leader yesterday expressed condolences over the tragedy, as did Prime Minister Dmitry Medvedev. Until now, Putin has been able to stand firm against economic sanctions and finger-wagging by the U.S. and its European allies. The tragedy, should investigators find it was caused by Russian-armed and poorly trained Ukrainian rebels, raises the stakes. Locked in a Cold War-style stand-off with the U.S. and Europe over the future of Ukraine, Putin may have to rein in the rebels if he realizes he’s unleashed an “uncontrollable force,” according to Angela Stent, director of the Center for Eurasian, Russian and East European Studies at the Georgetown University School of Foreign Service in Washington. Putin told ministers yesterday that Ukraine’s government was responsible for the tragedy because it wouldn’t have happened if there were no war, according to an official transcript of the meeting. “Such things are absolutely unacceptable,” Putin said, according to the transcript. A Kremlin spokesman, Dmitry Peskov, declined to comment on an Interfax report citing an unidentified Russian aviation official saying that the Malaysian Air flight bound for Kuala Lumpur from Amsterdam may have been hit by mistake by Ukrainian forces seeking to shoot down Putin’s plane. The Russian leader returned from a trip to Latin America yesterday. Russian Foreign Minister Sergei Lavrov dismissed Ukrainian accusations of Moscow’s involvement. Valentyn Nalyvaychenko, chairman of Ukraine’s state security, told reporters in Kiev today that three Russian servicemen handled the missile system blamed for shooting down the plane. “As far as statements coming out of Kiev go, that it was basically us who did it, I’ve hardly heard a single true statement out of Kiev in the past few months,” Lavrov said in an interview with state television channel Rossiya 24 today. Netherlands, Malaysia Flight MH17 carried 283 passengers and 15 crew members, according to a tally by the airline. The bulk of the passengers -- 173 -- were from the Netherlands, Malaysian Transport Minister Liow Tiong Lai told reporters today. There were 43 Malaysians on board, including crew, as well as passengers from the U.K., Germany, Belgium, Indonesia and Canada. The nationality of 20 passengers isn’t verified, the minister said. 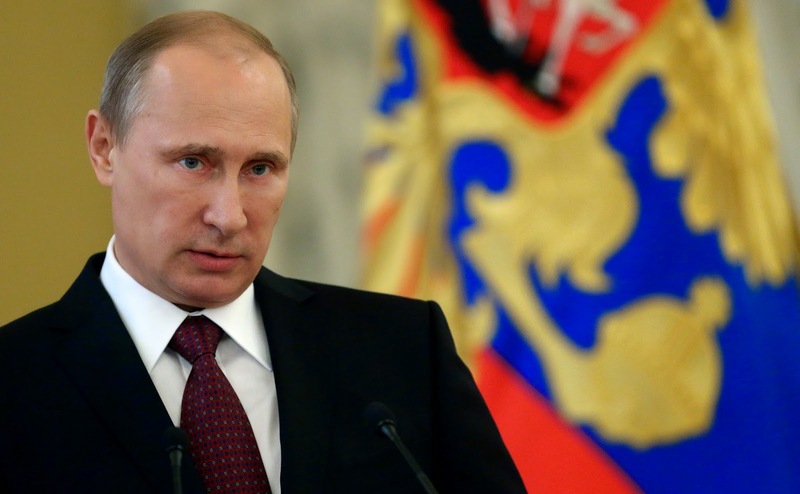 “Putin is in a delicate position right now internationally and domestically. This isn’t his Plan A,” Robin Niblett, director of the Chatham House research group, said in a phone interview in London. Outrage over the incident should prompt measures to end the fighting, said Ian Bremmer, president of the Eurasia Group in New York. It “would be a good time for Putin to reassess ‘all-in’ Ukraine strategy,” Bremmer said on his Twitter Inc. account. The downing of the aircraft may push Ukrainian President Petro Poroshenko to escalate his campaign against the rebels, and possibly spark Russian involvement, Bremmer said. “I do not believe Putin can allow the Ukrainian government to simply remove the separatists,” he said on Bloomberg Television. The separatists in eastern Ukraine aren’t entirely under Russian control, said Sam Charap, a senior fellow for Russian and Eurasia at the International Institute for Strategic Studies, a Washington policy group. The crash could well cause Russia to pull back tactically, Charap said. “I don’t think they’ll completely give up, but maybe rein in some of the crazies that they’ve let loose and enforce greater discipline,” Charap said in a telephone interview. The Soviets said they suspected it was a U.S. spy plane. The downing widened the rift with the U.S. and the USSR was forced to veto a United Nations resolution condemning its actions. In the aftermath of the attack, the U.S. was able to rally support among allies for the deployment of Pershing missiles in West Germany. The European Union and the U.S. may ultimately be moved to take harsher action as a result of the crash, Georgetown’s Stent said. “We could get much tougher sanctions out of this than the ones announced yesterday if Russia doesn’t come back to the table,” Stent said. The U.S. in its latest measures targeted some of the country’s largest corporations, including oil producer OAO Rosneft (ROSN), gas company OAO Novatek (NVTK) and lender OAO Gazprombank, by effectively cutting their access to American capital markets. Putin told President Barack Obama in a phone call yesterday he’s “seriously disappointed” at the sanctions, which won’t help to end the conflict in Ukraine, according to a Kremlin statement. The plane, which was downed at an altitude of 33,000 feet (10 kilometers), was most likely shot with a Buk anti-aircraft system, which requires a specially trained unit, said Mikhail Khodarenok, editor-in-chief of Defense Industrial Courier. Evidence so far indicates that the plane was struck by a weapons system known as the SA-11 or Buk, according to four U.S. officials who asked for anonymity because an investigation is continuing. The surface-to-air missiles, widely deployed in Eastern Europe, are mounted on vehicles that resemble tanks. A White House official said that a Ukrainian military transport plane shot down over eastern Ukraine on July 14 with eight crew members on board was flying at an altitude of 21,000 feet and could only have been downed by very sophisticated weapons systems. The official, who asked not to be identified by name because there was no authorization to speak publicly, said that the flow of heavy weapons from Russia and support for the separatists has increased during the past month. The training and tactics of rebels in eastern Ukraine has also grown more sophisticated, the official said. Sergei Markov, a political analyst who consults with Putin’s staff and often represents the view inside the Kremlin, said the shooting down of the Malaysian aircraft is most likely either accidental or a deliberate plot by Ukrainian authorities to embarrass Russia into reversing course. Russia’s Defense Ministry recorded use of a Ukrainian tracking station that’s part of a Buk-M1 missile system yesterday about 30 kilometers south of Donetsk, Rossiya 24 said on its website. Information from that radar could have been passed to any other Ukrainian anti-aircraft missile battery, the ministry said. The Ukrainians have three Buk anti-aircraft missile batteries and two S-200 anti-aircraft missile batteries in the zone where the plane was downed, the Russian ministry said. The Russian leader, in any case, won’t be pressured into renouncing all support for the rebels, according to Markov. “Putin will continue acting in the same way,” he said. The aircraft shooting highlights the conflict in Ukraine and Russia’s role in it, according to Carnegie’s Lipman. “We are dealing with a rag-tag army who have been armed with high-precision weapons and are shooting at anything that moves,” Lipman said.